The Peavey 5150 should need no introduction. 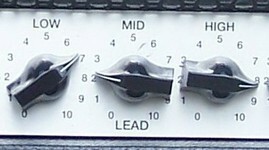 The 5150II is a 5150 with an improved clean channel, and a modified distortion channel. It also has a different power supply and a few changes in the power section. You can’t make a 5150 sound like a 5150II or vice versa without severe modification, but you can get them a bit closer by some simple mods. Later, the 5150 was relaunched as the 6505, and the 5150II as the 6505+. They made no changes to the circuit at this point. If a 5150 sounds different from a 6505 it’s due to different tubes, or the age of the components, not a change in design. The 5150 2×12 combo is different from both the 5150 and the 5150II. 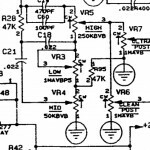 Tone-wise it’s said to be somewhere between the two, but I don’t know this circuit. The 6505+ 112 combo has a preamp nearly identical to the 5150II, but a new fx loop and power amp. This mod will make changes to the preamp section to make the ultra channel of your 5150II match the specs of the original 5150. This without affecting the clean/crunch channels. Your amp will be be growlier, more organic, more gainy and get a chunkier attack, but it will also become less tight. It will not sound 100% like the 5150, as there are some differences in the fx loop / power amp stage as well, but it will take it in the right direction. This mod is also applicable to the 6505+ 112 combo, but the component names differ. You will get a more twangy top end, more fizz, not as much of a raw growl to it, and a more processed feel/sound overall. If this is what you want, do the opposite of what’s stated above. The 5150 is biased very cold. Cold bias gives higher output power and adds crossover distortion.Crossover distortion sounds scratchy/buzzy. There’s too much, it will sound as if something is broken. Also, crossover distortion is most noticeable at low volumes. Hence, if you play loud your bias current can be set low to extend tube life. it is possible. I recently got an email from a man called Brian Mangan, saying that you can adjust the bias of this amplifier by altering the value of R14. I have not taken the time to check the schematic or try it myself yet. The EQ on the 5150 isn’t great. The main problem is that the mid control doesn’t work in the right frequency range. In my opinion, its’ focus point should be at a lower frequency. This is a very simple mod which will move the focus point of the MID band to a lower frequency. Replace the 50k mid pot with a 25k or 22.5k pot.Or, if you’re lazy, solder a 47k In parallel with R95. This does pretty much the same thing. This mod will make your EQ sweepable, however, moving the mid freq position will also affect the response of the bass and possibly the treble bands. 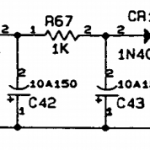 Replace R28 with a 10k resistor and a 250k pot in series. 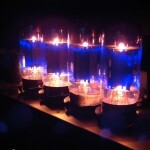 V5B(middle preamp tube): add 10pf silver mica cap to pins 7 and 8. This will remove hiss, make the gain less fizzy, make the high mids clearer and improve clarity in chords. between pins 6 and 7 it’s even more efficient, but will also darken the amp a lot. R9: piggyback a resistor on top of the 1 meg resistor. 120k is a good starting point. You can try out 68k, 100k, 120k, 150k, etc. Lower value means tighter amp, but if you go too low, the amp will be choked out. I tried tinkering with R15 and using Marshall values, but it took too much away from the original sound. The 39k is the SLO value as well. add choke somewhere. I have to study these further. To be continued. combo has a preamp nearly identical to the 5150II, but a different fx loop and power amp. Any progress on the bias mod for 6505+ 1×12? Thank you for posting this page! Thanks for your interest! This summer has been very busy, and this project is one of those that had to wait. I still intend to make up a design and do the modification, but I have no clue when. Hi, for the 2×12 combo not exist this mod? Hi, I have not looked at the schematics for the 2×12 schematic. The mods should be possible on the 2×12 combo as well, but at this point I’m not familiar with the circuit. Hey on the 6505+ 112 is there a FX loop mod it sounds awful when I use pedals a guy said something about putting a Resistor solder to the fx input my guitar tech said if I found a diagram he will do it or a lnk. So far I’ve only used the fx loop on the 112 for plugging in other preamps, bypassing the 6505+ preamp. So, I was not aware of this problem. The fx loop is not the same as the original design, but I don’t remember how much they differ. I don’t have time to look into this right now, but let me know if you find a solution, and I’ll include it in this write-up. I M LOOKING FOR A MOD THAT MAKE THE CLEAN/RHYTHM CHANNEL OF MY 6505+ 112, SOUND LIKE THE 5150II CLEAN /RHYTHM CHANEL WHEN THE BRIGHT SWITCH IS ENGAGED. THERE IS SOMETHING LIKE THAT? I do not have either amp here right now, but I have brought my 6505+ 112 to the workshop at work to have a look at a problem with the fx loop, and perhaps do some of the mods I mentioned here. FX loop fix is put a .022uF (Microfarad) capacitor in parallel with R86. I really need some help with the 6505+ 112 Bias Mod.. :\ Have you made any progress with it? Any news on the 6505+ 112 bias mod? Hi Boda, thanks for your interest. I’m sorry but right now I have my hands full with other projects, and I don’t see myself getting back to this in the near future. If you figure it out, feel free to let me know how it’s done and I’ll add it to this guide.